As we try to do each year, we organised a day just for our Sixers and Seconders as a thank you to them for carrying out their extra responsibilities within the Pack, including looking after their Six. 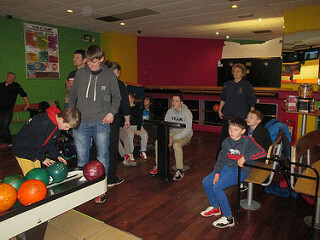 This year we took three Sixers, four Seconders, one Young Leader and five Leaders to Leamington Spa Tenpin for an afternoon of tenpin bowling followed by tea at the Bowling Alley. The Sixers plus Young Leader and two Leaders made up one team while the Seconders plus two Leaders made up the second team, but with so much laughter, banter and a lot of rivalry, mainly between the Leaders, we lost count completely of which team won or which individual got the highest score! Nevertheless, a very enjoyable fun filled afternoon.